Contrary to what your friends and neigbours may claim, you can go through a stress-free and hassle-free waste clearance project. 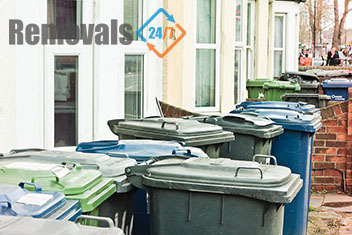 You can do that by delegating the execution of your rubbish removal or related job in London to us. We are professional and fu lly certified contractors and we have been handling commercial and domestic garbage collections for a number of years. Our London junk disposal services are highly appraised by our clients and are described as the most reliable and affordable solution for waste related troubles. We work with cost effective prices because we want our privet and commercial clients to have the peace of mind that they can turn to us regardless of the size of their garbage collection budget. You can see in advance how much our assistance will cost you by giving us a call or sending us an e-mail in which you are requesting a personalised, free and non-binding quote. Recyclables: We short this type of garbage into their respective groups (paper, plastic, glass, metal and e-waste) and haul them to a specialised rubbish processing facility so that they can be treated and reused for the creation of new things. Non-recyclables: This type of junk we can type to any garbage depot of your choosing as we are licensed to work will all waste storage sites in the city. Our company is authorised to collect all types of rubbish with the exception of toxic and chemical junk. So don’t be hesitant to give us a call if you have common, sanitary, construction or gardening waste on your property which you wish to be removed because we will happily lend you a hand and make sure that you benefit from a clutter-free household or place of work. Bear in mind that we also provide contract junk disposal to clients in London. The collection schedule will be set to accommodate your personal preferences and agenda, and can be readjusted periodically in dependence of your private and business duties. We can also lend you a hand with your garbage storage as we rent out open and covered skips of various sizes. You can learn more about our rubbish clearance services and disposal solutions for London customers by either browsing through our website or contacting our customer consultants via telephone or e-mail. As you already know we operated throughout London. The city lies in the southern parts of the United Kingdom and has a population of over 13 million people, metropolitan area included. It is home to the Royal Albert Hall which is one of the largest and most popular concert venues in Britain and Europe. It was constructed from 1867 to 1871 and was designed by Major-General Henry Young Darracott Scott and Captain Francis Fowke. The venue has a maximum capacity of 5.272 seats and stages musical spectacles and concert on a regular basis. It is named after Prince Albert of Saxe-Coburg and Gotha, the husband of Queen Victoria.